Let’s get the easy bit out of the way first – Yucatan are Welsh, make music of sky kissing beauty and sound more than a little like Sigur Ros. It might be a lazy comparison, but it’s one that is set to dog the band for as long as they stick closely to the blueprint sound patented by Iceland’s most successful recent musical export. It’s not just that Yucatan choose to sing seven of the eight tracks here in their native tongue – their music employs a similar arsenal of sonic tricks; its the Sigur Ros playbook with all the epic grandeur that goes with that. 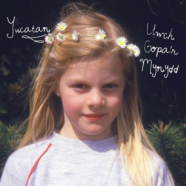 None of this should deter you from checking out Uwch Gopa’r Mynydd because it is one of 2015’s loveliest records – a dreamy, light infused album of gorgeous music, with its roots in Post Rock but with just enough personality of its own to make the Sigur Ros comparisons melt into the background. It’s a record reportedly forged and inspired by the natural beauty of Snowdownia – the band resorted to the novel approach of streaming the album a week ahead of release at the summit of Snowdon for those devotees willing to make the trek. ‘Ffin’ makes for a perfect introduction to the album – a beautiful lovelorn melody replete with sighing strings and wide open spaces. The guitars kick in and we are skyward bound. ‘Cwm Llwm’ trails in with twinkling glockenspiel and a ring of familiarity – it’s a few bars in before another lazy comparison springs to mind. Super Furry Animals were one of the first mainstream Welsh bands to sing some of their songs in their native tongue and there are definitely elements of what they do here in the strong melodies and singer Dilwyn Llwyd’s softly lilting voice. ‘Cwm Llwm’ opens out into a string drenched epic that builds and builds – pure gorgeousness. The album continues resolutely in this vein – eight tracks of melancholic grandeur; the lyrics may be impenetrable but the feeling conveyed is one of uplifting almost transcendental beauty. It’s almost impossible to listen to an album like this and not succumb – Yucatan coax magic and light out of familiar chords and melodies and the results are intoxicating.